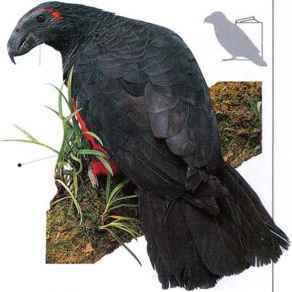 A strong-living parrot of arid country, this species looks like a cockatoo but is more agile and active in its behavior. The Cockatiel occurs on open plains, sometimes with light woodland. Fairs or small flocks arc-seen feeding on the ground, camouflaged by their colors. They pick up fallen seeds of grasses, weeds, shrubs, and trees, as well as eating berries and visiting harvested fields tr> feed on leftovers of grain. If alarmed while-feeding, the birds fly up, often settling in a dead tree, where they make themselves inconspicuous by perching lengthwise on larger branches. I- light is fast and direct, with strong, regular w ingbeats, in which the large, white wing patches are conspicuous. Birds maintain contact during (light with a loud, warbled, double note. In some parts of its range the Cockatiel leads a nomadic life, traveling about in any direction in search of areas where food is available. Other populations migrate-between summer and winter ranges. • NEST a hollow ill a tree, often near or standing in water. •DlSTRIBl TIO.N Australia, except for wetter coastal areas. 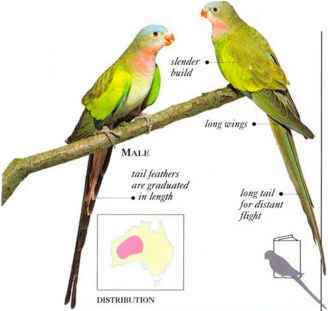 I here is a startling difference in color between the sexes in this stoutly built parrot species. It is seen mainly in lowland forest, also occurring in more open country where groups of tall trees are found Birds occur in pairs and small parties, in which males are more in evidence than females. Flocks gather to feed where fruit is ripe, and larger flocks are seen roosting in trees. The diet consists mainly of fruit, but nuts, seeds, buds, blossom, and nectar are also eaten, l ite flight is strong but rather slow, with deliberate, downward wingbeats and frequent, short glides. 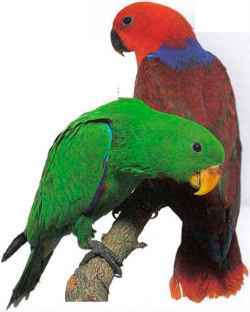 During longer journeys, the Eclectus Parrot often flies high above the tree canopy. The call is a raucous, screeching sound. • NEST A hole in the trunk of a tall tree, often situated close to the forest edge. • DISTRIBUTION Islands of E. Indonesia, New Guinea, the Solomon Islands, and extreme N.K. tip of Australia. Bald-headedness in birds is usually associated with eating messy foods, and this parrot has a bare face that may possibly be connected with its mainly fruit diet. It eats softer fruits, particularly figs, as well as blossoms antl probably sips nectar from flowers. Living in mountain forest, it sits for long periods on high, bare branches that project above the forest foliage. 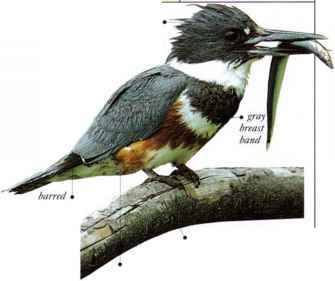 It tends to jump from twig to twig with a quick wing-flick, rather than using the bill to climb about. Birds screech noisily during flight. They fly strongly but slowly, with rapid, shallow wingbeats and the occasional glide. What is a Cockatiel like in South America?